Defender Shane Duffy felt Saturday's 1-1 draw at Norwich was a good test for Albion as they continued their preparations for the new season. Pascal Gross gave Brighton the lead on 20 minutes but Norwich levelled through Marley Watkins' thunderbolt just before half-time. 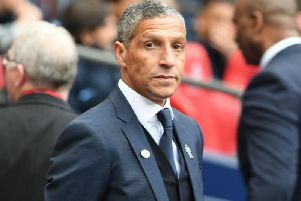 The Championship Canaries made a bright start as Albion struggled to keep possession - and Brighton boss Chris Hughton admitted afterwards that his team needed to be better on the ball. Having beaten Fortuna Dusseldorf (2-0), Crawley (6-0) and Southend (3-0) in pre-season, Albion's unbeaten run continued and Duffy said: "It was a better test. They are a good team in this league and it was a step up from Southend. "We are still not fully there yet. In a way it was good. They had a lot of possession, like a lot of teams in the Premier League. Defensively it was quite solid. "They started quite well. We were a bit sloppy on the ball. They are expansive, so we had to do a bit of defending early on. The formation caught us out a little bit. We had to adapt to the 3-5-2. "We got a grip of the game once we scored but the equaliser killed us a little bit and it was even after that." Brighton travel to Girona tomorrow (7pm), before hosting Atletico Madrid at the Amex on Sunday (4pm). Their opening Premier League game is at home to Manchester City on August 12 (5.30pm).